The jaw joint (as known as the temporomandibular joint or TMJ) is a very hard working part of our body. It is involved with all aspects of our life – talking, eating, breathing, swallowing and laughing (not to mention grinding, clenching, fingernail or pen chewing….) The joint can absorb a surprisingly large amount of force when chewing with the average bite force being around 50-70kgs, and potentially up to 200kg with night time clenching and grinding! The jaw joint is quite a complicated joint. Like many joints it contains a cushioning cartilage disc. It also contains many supporting ligaments and muscles that extend internally, as well is down the neck, up to the crown of the head and across the face. Not the mention the fact that there is a jaw bone (the mandible) and associated teeth that connects both joints. It is sometimes described as the most complex joint in the body as it is the only joint where the LHS joint is connected to the RHS joint so what happens on one side, inherently affects the other side. With such a complicated, hard working joint, and so many stressors and irritants, it is not surprising that things can sometimes go awry. TMJ dysfunction can occur when there is a problem with the disc, ligaments, muscles and/or bones of the TMJ. The joint itself can get irritated and inflamed. The disc can get displaced (like a slipped disc) which can put pressure on the nerves in the joint and make the joint less effective in absorbing the enormous forces and friction that come from using the joint. The joint can get stiff, limiting your movement. Or the joint can become too mobile and allow too much movement, stretching everything beyond their ideal limits. Due to its close muscular interaction with its surrounds, it can also be affected by problems with the teeth, throat, neck and even alterations in posture, or posture problems. It is possible that a neck problem may be affecting your jaw and vice versa. An unstable bite due to missing teeth or malocclusion can cause jaw pain long term if uncorrected. Traumatic injuries to the jaw (e.g. from a car or bike accident or a blow to the face) can damage the TMJ structure and cause pain. 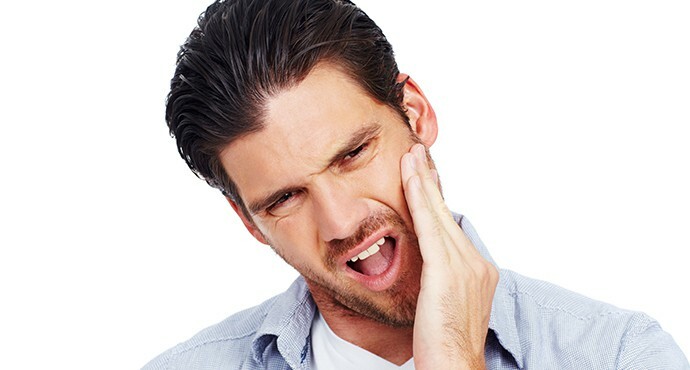 Prolonged trauma from a habit such as clenching, grinding or fingernail biting can also damage the TMJ, as well as causing muscle spasms resulting in pain and tenderness. Many people are completely unaware of their clenching or grinding habit, especially if it occurs at night during sleep. People who sleep on their stomachs often place their neck and jaw in positions that are less than ideal. Additionally, arthritis (either osteoarthritis or rheumatoid arthritis) may contribute to breakdown of the cartilaginous disc on each side of the TMJ and cause pain. Your Medland Dentist may notice signs of tooth wear as part of your dental examination. Whilst tooth wear itself is not a sign of TMJ dysfunction, may people who clench and grind their teeth also experience some of the symptoms listed above and it is not until the tooth wear is diagnosed that the full extent of the problem is discovered. Severe damage to the TMJ is extremely complicated to manage. There is no ‘quick fix’ and surgical repair generally has a very poor prognosis and comes with significant risk. Subsequently, preventing damage to the joint is paramount and as with other dental issues, early diagnosis will improve treatment outcomes and options. Treatment generally involves a combination approach. Referral for physiotherapy with a craniofacial or craniomandibular physiotherapist is an important initial step in investigating how the joint is functioning (or not functioning), investigating if the pain is coming from the joint, other muscles or the neck. Palliative treatment is provided as well as home exercises to help get the joint and associated muscles functioning better. If there is an associated traumatic habit like fingernail biting, pen chewing, clenching or grinding, managing the habit is important. This may involve “self management” during the day and a splint or “night guard” worn at night to prevent damage to the teeth and the TMJ. In advanced stages referral to an oral surgeon to discuss surgical approaches may be required. What can I do to help my jaw pain? Restrict intake of hard and chewy foods (including nuts and chewing gum) and cut food into small pieces. Stick to a soft diet and try to eat slowly and control chewing movements. Be mindful that caffeine is a potent stimulant and depending on your level of intake may be contributing to muscle tightness. Heat application relaxes tight muscles (in spasm), relieves pain and soreness as well as increasing circulation to inflamed tissues. The use of heat packs, heated damp washcloths or hot water bottles may help relieve your pain. Apply for 20 minutes with an hour or more between applications. Follow any manufacturer’s instructions and ensure your application of heat is within a safe temperature so as not to injure the skin. Cold packs including crushed ice, chemical gel packs or even frozen peas can alternatively provide relief. Apply until the area goes numb (usually 20-25 minutes) and use every 2 hours. A thin cloth around the cold packs assists with initial contact. Once again, use with caution to avoid skin irritation and injury. Anti-inflammatory medication, such as ibuprofen (Nurofen™) can assist with resolution of the muscle inflammation in the jaw. Ensure that this is only used short term and according to the directions on the pack. Consult your doctor or dentist if you are unsure. Stress management is important to ensure long term resolution of jaw pain and discomfort. Reducing the stresses in your life or focusing on relaxation activities that suit you (such as breathing exercises, acupuncture, yoga or meditation) will contribute to reduction of muscular tension in the jaw.